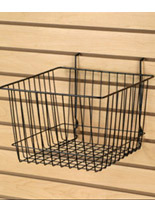 Slatwall accessories are one of the many in stock product lines offered by StoreFixture.com! We have over 1 million fixtures & displays in stock! Deep pocket design holds a great amount of products. Lowered front panel makes it easier to access merchandise. Clear acrylic showcases items beautifully. 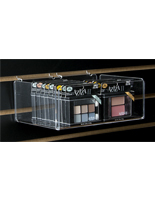 Slatwall accessories, which are bulk acrylic bins, make excellent merchandisers. 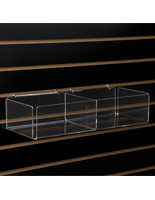 These slatwall accessories fit all the slatwall and slotwall fixtures sold by Displays2go. 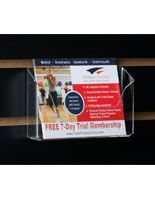 This acrylic display, which is perfect for bulk merchandise, is 5.5" wide x 5.5" high x 7.5" deep. We provide these slatwall accessories with a slanted down front lip so it is easy for your customers to browse. 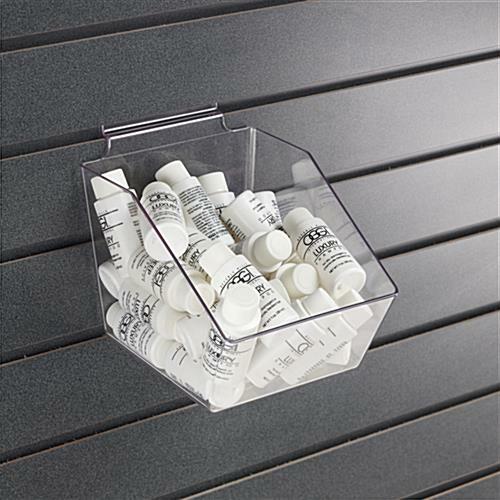 These bins are perfect for selling sample items, candy, gum or any small, bulk items. The bins, which have a low price point, make it easy for you to buy several units and sell multiple products. 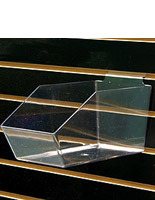 These slatwall accessories are made from high quality, clear acrylic. 5.5" x 5.5" x 7.5"